Reaction: After the plot phase begins, choose a character you control. Remove it from the game until the beginning of the next plot phase. 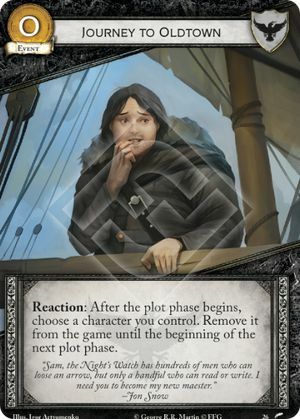 Characters removed by Journey to Oldtown re-enter play at the beginning of the first plot phase step (1.1), which means before any Reactions (including Forced Reactions) to the plot phase beginning trigger. Characters removed from play will return under their owner's control.